THIS is the Antifa that the media and most of Congress, including slimy Republicans, are slamming President Trump for condemning, a criminal terrorist organization that is being allowed to injure innocent people and destroy public and private property with impunity. In a Powdered Wig article from a few days ago, we publicized a video that Antifa does not want to become viral. It shows an old man walking across the street in Charlottesville during the recent demonstration there. He is assaulted by a group of Antifa thugs and thrown to the street, where he was beaten repeatedly, all for the egregious crime of walking across the street. Now, this! 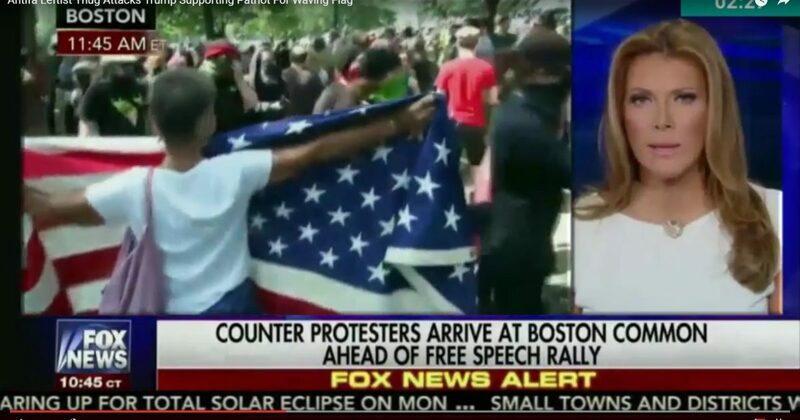 Check out this video of an elderly woman in Boston being attacked by Antifa while she was standing still, proudly displaying the American flag. An Antifa thug grabs her flag to take it away from her, but she hangs on, the Antifa thug dragging her down street and across a grassy area, where she falls to the ground. Terrified, she picks herself up and runs to get away from the criminal thugs. But, mind you, Antifa isn’t at fault here. They are simply innocent and peaceful protesters demonstrating against the real criminals who, believe it or not, are guilty of heinous acts like displaying an American flag.